A pointer to the parent widget for the dialog. If the parent widget isn't NULL, it's blocked and its cursor is changed to reflect this. The parent argument is also used to position the dialog, as described below. A pointer to a PhPoint_t structure that specifies the position of the dialog (see below). The title of the dialog; if this is NULL, a default title of “Select Printer” is used. A pointer to a PpPrintContext_t structure that was created by PpCreatePC(). This pointer must not be NULL. PtPrintSelection() updates the print context. Flags that enable or disable parts of the user interface (see below). This argument should normally be set to Pt_PRINTSEL_DFLT_LOOK. Your application can call PpSetPC() to modify the print context before calling PtPrintSelection(). These modifications are propagated to the PtPrintSel widget. Note that some modified context settings may not be displayed or may be reset (e.g. 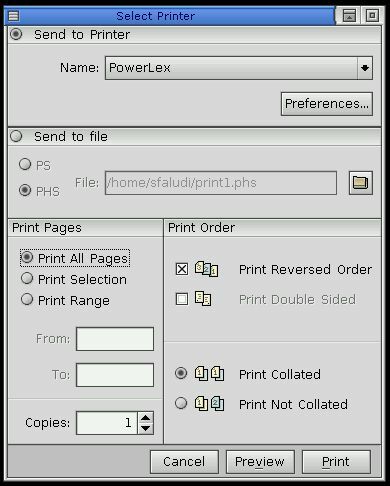 if the selected printer doesn't support double-sided printing and the Pp_PC_DUPLEX member was set in the context before calling PtPrintSelection()). Enable the Send to file pane. Disable the Print Range toggle button and the From and To fields. Disable the printer-name combobox. Physical output goes to the default physical printer whose name is shown. Disable the Print Selection toggle button. Enable the Print Pages, Print Order and Copies panes. The Pp_PC_DO_PREVIEW member of the print context is set when the user presses the Preview button. This means that the context can be passed to the printing function, which spawn the print-preview application if necessary.